Washington, D.C./Anacostia is a star article! It is a high-quality article complete with maps, photos, and great information. Anacostia is the popular name for the huge swathe of the capital consisting of the many neighborhoods East of the River. Its heart, in the small, historic neighborhood of Anacostia, is immediately across the Frederick Douglass Bridge from the newly built Nationals Ballpark. Most D.C. metro area residents reflexively recoil in fear at the sound of infamous "Anacostia," known only for its extreme poverty, prowess in homicide statistics, and the ever lurking danger of accidentally crossing that river and falling into a panic attack, hopelessly lost among its labyrinthine streets. This is all more than a little melodramatic and misinformed. There are a bunch of good reasons to add a day trip to D.C. East of the River on your itinerary. 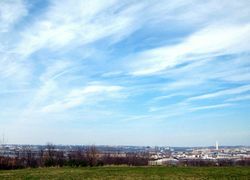 First and foremost, with its unusually rural character and extreme poverty, Anacostia is so different from the rest of the city that no serious traveler could be bored. The mere fact that such a place could exist so incongruously in the shadows of the nation's capital is reason enough to send a tingle up a curious traveler's spine when crossing the Anacostia River. 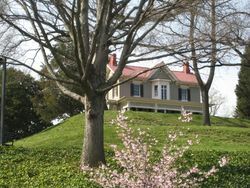 But the most important reason to visit is simply to better appreciate the area's rich history, which served as home to notable residents from Frederick Douglass to Ezra Pound, Marvin Gaye, and the infamous former mayor of D.C., Marion Barry (who remained Ward 8's councilman until his death at age 78 in 2014). Fortunately there are two excellent small museums here to help visitors do just that—the Smithsonian Anacostia Museum and the Frederick Douglass House. 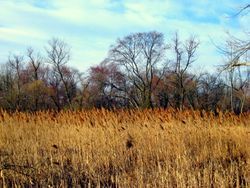 Once covered by marshy swamplands, the region was first inhabited by a small settlement of Nacochtank Native Americans, who gave the Anacostia River its name. (The marshes have since been drained, save the beautiful preserve at Kenilworth Aquatic Gardens.) The area began to see development as a part of the nation's capital in the 1850s, when Uniontown was developed as an affordable neighborhood for workers employed at Navy Yard across the river. The neighborhood soon after gained one very famous resident just to the southeast in the abolitionist, prominent black intellectual, and former vice presidential candidate, Frederick Douglass, who at the time became known as the Sage of Anacostia. Prevented from living in Uniontown proper by official segregation laws, he built his house just outside at Cedar Hill. Beginning with the Civil War, D.C. East of the River saw a military-fueled construction boom, as the North set to defend the capital against incursions from Confederate Virginia, and to protect Navy Yard from Confederate artillery, with a ring of forts in the region's hilly terrain. The forts have since been dismantled, but the sites of the two most notable forts, Fort Stanton and Fort Greble, have been turned into parks. Most of the Anacostia's development took place in the early 20th century, particularly during The Great Migration of southern African-Americans to the North, and during World War I, when the U.S. government built the Anacostia Naval Station and Bolling Airforce Base. Post World War II, Anacostia underwent rapid and dramatic demographic change—from a population that was nearly 90% white to one that was (and is) over 90% black. The first catalyst for such dramatic neighborhood change was the construction of I-295, the Anacostia Freeway, which cut off the entire population of Greater Anacostia from the waterfront. Second, during the 1950s there was a large influx of new African-American residents—not coincidentally at the same time as the federal government made the D.C. public school system the first fully integrated system in the country in 1950. By 1957, the city became the nation's first majority black city, with a good deal of the city's African-American population living in the communities of Greater Anacostia which had been founded by free blacks as early as before the Civil War. The third catalyst was the creation of many massive public housing structures East of the River, which concentrated D.C.'s poorest residents in areas far away from the city center and its services and amenities. The corresponding White Flight in the 1950s of white residents from old communities such as Uniontown (now known as Historic Anacostia) took with it most of the community infrastructure and wealth. Anacostia, always the poorest section of D.C., badly needed investment from the federal government (which administered the city), but investment was not forthcoming; as a result, D.C. East of the River suffered, and continues to suffer, from chronic neglect. There are, however, reasons for an optimistic vision of Anacostia's future, as the crime rate has plummeted since the peak in the early 1990s, the city under home rule has renewed its efforts to help Anacostia grow, and there are plans for a huge new stadium for D.C. United, the local soccer team, at currently empty Poplar Point. That last point, in particular, has fueled speculation over whether downtown Anacostia will see a commercial and real estate boom, as the stadium proposal includes a hotel, office and retail space, and riverfront revitalization. The biggest issues of the day in Anacostia remain drug crime and the disastrous public schools. A great read for visitors to the area is Pulitzer Prize winning author Ron Suskind's A Hope in the Unseen. The biography chronicles the exceptionally rare journey of Cedric Jennings, a student at the abysmal Ballou High, who managed to escape the usual fate of Anacostia's high school students and go on to Brown University. For a north-oriented key better suited for printing, click here. The historic Downtown Anacostia neighborhood is easy enough to reach by Metro. Take the Green Line to the Anacostia Station, then walk out to Martin Luther King Jr Dr and turn left to walk north a half of a mile to the historic center. (To skip the walk, you can take the B2 Metrobus towards Mt Rainier.) On foot, you could easily see the Big Chair, historic center, grab some take out from Cole's, and then visit the Frederick Douglass House. You could walk from the Anacostia Station to the Anacostia Museum up Morris Rd, but it's a hilly mile and a half walk, and Morris is a lonely road for visitors to be walking on. Take the bus instead. The Kenilworth Gardens are further from downtown, but still easy to reach via Metro. Exit the Deanwood stop on the orange line. Take the pedestrian overpass across Kenilworth Avenue and go left on Douglas Street. Go right on Anacostia and enter any open gate on your left. It's about a half mile walk to the gate. Anacostia is well served by bus. The B2  runs from the Anacostia Green Line Station up Martin Luther King Jr Dr, then Minnesota Ave, and then across the Pennsylvania Ave Bridge to the Blue/Orange Line Potomac Avenue Station, and on to RFK Stadium. The northbound route passes right in front of the Frederick Douglass House (southbound requires you walk a block from MLK Jr Dr). 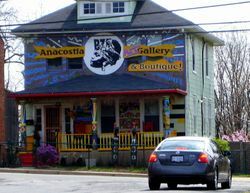 For the Anacostia Museum, walk out to the W2/W3 bus  stop on Howard Ave (in front of the Anacostia Metro stop). Either bus will take you right to the museum's doorstep. On the way back, for the heck of it, you could pick up the W2/W3 where you left off and take a meandering scenic route through Naylor Gardens, Garfield Heights, Shipley Terrace, and Douglass to the Congress Heights Green Line stop. 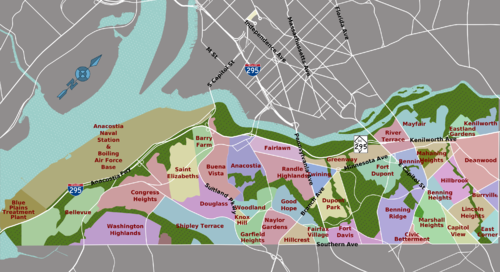 "Greater Anacostia" includes a plethora of communities with individual character—there's more to it than the historic neighborhood! A car is a very convenient way to visit Anacostia (since on-street parking is easy pretty much anywhere), and is the best way to really get to know D.C. East of the River. I-295 (SW Fwy) and DC-295 (Anacostia Fwy/Kenilworth Ave) are the main highways, which will quickly shuttle you east and west around this district. Other major thoroughfares relevant for visitors include Martin Luther King Dr especially, but also S Capitol St, Pennsylvania Ave, and Minnesota Ave.
From downtown D.C., the most attractive route across the river is the 11th St Bridge (I-295), which provides spectacular views of Historic Anacostia going south, and even more amazing views of the Capitol heading north. It also dumps you off right at the intersection of MLK Jr Dr and Good Hope Rd, making it very convenient for visiting downtown Anacostia. The other two bridges heading south from downtown are at S Capitol St and Pennsylvania Ave. To drive to the Kenilworth Aquatic Gardens from downtown, it really doesn't matter which bridge you take—just get on DC-295 going east (Anacostia Fwy/Kenilworth Ave). It's tricky to get off at the right point, though—you must be on the southbound side of Kenilworth Ave, so make a U-turn at the city border, then get in the service lane to turn right on Douglas St, then right on Anacostia Ave, which will take you right to the park gates. Coming from the Capital Region of Maryland, take the exit 22B off I-495/I-95 for MD-295 (Baltimore-Washington Pkwy), which will turn into DC-295 after you enter the city. The simplest way to get to downtown Anacostia is to take DC-295 to continue on I-295 southbound, to exit 3B and turn left on Howard Ave, then turn left on MLK Jr Dr.
From Northern Virginia, get on the Beltway (I-495/I-95) going east to exit 2A-B to get on I-295 northbound. OK, canoe is not a very practical way to visit Anacostia, but it is by far the most fun. 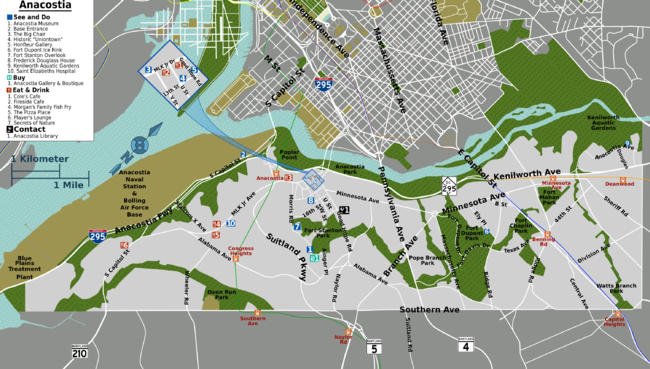 The Anacostia River is easily navigable by canoe, and there are several places to launch: Anacostia Park, Bladensburg Park  (in Bladensburg, Maryland), and the public boat ramp at Langston Golf Course  in the east of Capitol Hill. The main destinations for a canoer are the Anacostia Park, which covers much of Anacostia's waterfront, and of course the Kenilworth Aquatic Gardens, to which you can simply pull right up and disembark. It's important to watch the tides, though, since at low tide you won't get anywhere near the gardens. If you haven't canoed on the Anacostia before, pay the Anacostia Watershed Society's website  a visit. 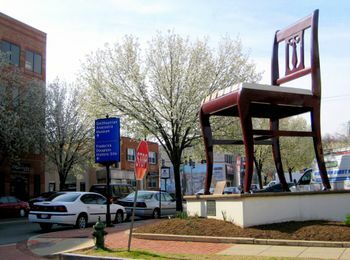 The principal sights—the ones you have to see in order to lay claim to having visited Anacostia—are the Smithsonian museum, the Frederick Douglass House, and, of course, the Big Chair. The two museums are small but excellent, and the latter attraction is a good photo op! The Kenilworth Aquatic Gardens are a destination in their own right, and merit a visit during the summer even if you are otherwise uninterested in visiting Anacostia. Sit-down establishments are near impossible to find East of the River. If you're looking for a place to go out and drink (legally), you have only one good option in the Player's Lounge, where you'll likely share the space with local politicians. Accommodations are extremely scarce in Anacostia. You will almost certainly have better luck looking elsewhere for a hotel. There are accommodations on the military base, but those are only available to those who have official business there (i.e., people actually allowed on the base). If you are intent on staying East of the River, the closest you'll get are the hotels in Suitland, MD, fifteen minutes away, by the junction of I-495/I-95 and Branch Ave. In the time honored words of former Mayor Marion Barry, "Outside the killings, D.C. has one of the lowest crime rates in the country." This was considered in poor taste at the time, and rather inaccurate, but it contains at least a nugget of truth. With the one exception of homicides, D.C. East of the River actually sees a good deal less violent crime than the trendy north central neighborhoods—you are less likely to be assaulted, mugged, etc. here than in Adams Morgan! Big deal, you say—you'd rather get mugged than shot to death. But muggings are always a far greater problem for travelers. They often target visitors unfamiliar with their surroundings, and occur with far greater frequency than rare, but highly publicized homicides. The type of violence here is far less likely to affect visitors than residents. It's quite unlikely that you will experience anything dangerous walking down main streets during the day, especially in the Historic Anacostia neighborhood. Which are those main streets? When visiting the "downtown" neighborhood, stick to MLK Jr Ave and Good Hope Rd, and the side streets in Historic Uniontown around Frederick Douglass' House. Walking from the Deanwood Metro station to the Kenilworth Marshes at night would be a bad idea, but there isn't much reason to be there after dark anyway. Prince George's County surrounds Anacostia on all sides not bounded by the river, and serves an interesting contrast to the city's poorest district. Though a suburb, PG County is in places more densely populated, has far more commerce, and is indeed the wealthiest majority-black county in the United States. NASA's visitor center is just up DC/MD-295 by the beltway, and when combined with the Kenilworth Aquatic Gardens, makes a great itinerary (especially if you are traveling with kids). For more of D.C.'s African-American history, the mecca is Shaw, which served as home to D.C.'s Black Broadway in the early 20th century. This page was last edited on 8 November 2015, at 04:27.